Hi there everyone, I'm pleased to see you all again. I'm kicking back in sunny Granada at the moment in the South of Spain. There isn't a whole lot to do here but wander the 'labyrinthine alleyways' of the Moorish quarter where I'm residing and sample the 'myriad of tapas bars' that line said alleys, so I thought it was time for an update on my going ons recently. There are only really two things of interest that spring to mind at the moment. The first is a day trip I took to Gibraltar while I was staying on the coast. Although we've al heard of the 'Rock of Gibraltar', if you're at all like me you'll have no idea of any specifics relating to it. Gibraltar is a small enclave on the southern Spanish coast that is occupied by the UK, but from what I can work out it's more like one of those 'country states' that are dotted around Europe, like Andorra and San Marino. You need a passport to get in, some countries need a Visa and it has its own currency. 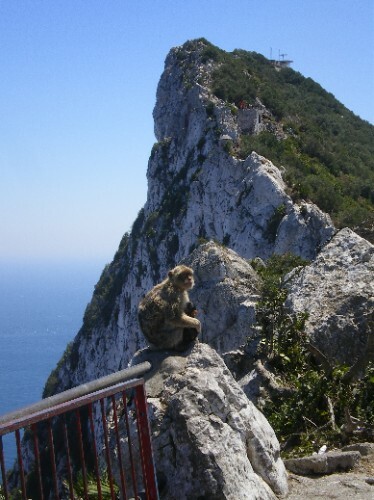 The place is only 5kmx1km and almost entirely taken up by 'The Rock', a massive chunk of limestone that allows you to look into three countries at once (Spain, Morocco and Algeria) and also houses the only wild monkey colony in Europe (although there's nothing wild about these bag snatching, tourist feeding, cheeky monkeys). Based on the rocks height and location I'm guessing it made for a good place to monitor the comings and going into the Mediterranean, which is why it ended up with UK ownership. The main reason I wanted to go was based on the description in my Lonely Planet, 'A time capsule of 1960's Britain'. Considering the only frame of reference I have of that era is based on Austin Powers movies, I was expecting lots of bright colours, girls with big hair with lots of eye makeup wearing dresses covered in flowers and blokes getting round in velvet suits with lots of ruffles. What I got was some narrow streets, a mall lined with tax-free shops, a Mark & Spencer and pubs with names like 'The Sparrow and Horse' and 'Old Geezers Place'. I spent most of the day on the rock. I visited the monkeys, climbed to the peak and walked to the coast, effectively walking from one border to the other. Views from the rock were pretty good and it's deceptive from below how sheer the rock is, the top section is basically a knife edge - I wouldn't want to be there on a windy day. Probably the only other interesting thing about the place is that the runway to the airport runs adjacent to the border and you have to walk across the runway to enter. Gates go down and the border temporarily closes to when a plane has to land. It gave me a chance to see a plane land up close, so I guess that another thing to tick off the list of things I never expected nor wanted to see but I'm kinda glad I did. The other exciting thing I did was turn another year older. Since last year I celebrated by going white water rafting in Slovenia, I decided to go with the theme here and visit the proclaimed largest water park in Europe. We grouped together five of us from my hostel in Seville and headed off for a day of waterslides and wave pools. Wet'N'Wild it wasn't, but it was still a good day out. Probably the funniest thing that happened was the parks terribly enforced rule of no piercings, necklaces and any sort of dangly things on the slides. The problem was no one who worked there seemed to know what the actual rules were. Some of them told us we needed to sign a waiver at Information. Information had no idea of any waivers, just told us to cover them up the piercings with band-aids or plasters. Then someone on some other ride didn't allow watches, but it was OK to put them in your pockets, or hold them in your hands. It was Spanish efficiency and bureaucracy at its best and I'll have more to say about it at a later date. So, that's the two most exciting things that have happened recently. I'm slowly making my way through Spain for La Tomatina at the end of the month (google it). Until then, I will say Adios.